Recipe: Eggs Benedict, featuring the most amazing Hollandaise sauce you will ever eat. | Dinner Love. Recipe: Eggs Benedict, featuring the most amazing Hollandaise sauce you will ever eat. Eggs Benedict and I go back. Way back. It was one of the first dishes I taught myself how to make. I had it for the first time in a restaurant in Livermore, CA while having brunch with my mother’s side of the family and immediately thought that it was one of the most delicious things on the planet. This is because it is nearly all fat, of course, but I digress. All things in moderation! Just eat some vegetables for dinner and you’ll be fine. 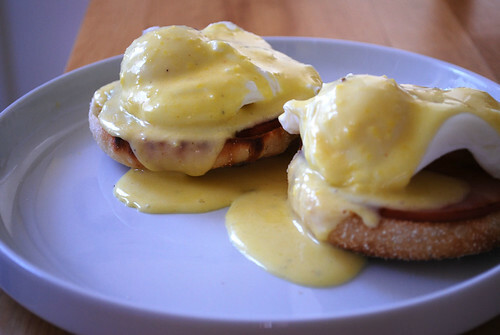 Eggs Benedict is the perfect dish to make when you want to impress someone in the morning. Be it your girlfriend (or boyfriend), the person you just happened to wake up next to, or even a family member. Your mother, perhaps? There is a day for celebrating mothers, you know, and it’s quite close. Your mom would be super-impressed if you showed off your mad cooking skills with a little eggs bennie. Note: this recipe serves 2. 3 egg yolks, 1/2 stick of butter, lemon juice, salt and pepper. Most recipes that I have looked at call for 3 egg yolks to 1 stick of butter. This is mularkey. Don’t listen. You may think I am crazy for doubling the amount of egg (and hey, maybe I am) but this is how I’ve made Hollandaise since the beginning of time. (Ok, 10 years). Also, you NEED the lemon. I’ve been known to order Hollandaise on the side with a side of lemon in restaurants, whereupon I promptly receive dirty looks for adding more lemon before I put the sauce on anything. What can I say? I know what I like. look, there I am in my blue striped dress! First thing’s first, you will need a double boiler to make the hollandaise. I don’t have one, so I fake it with a metal bowl and a saucepan. You can use any bowl that is large enough, and that is heat-resistant. Take 3 eggs, and separate the yolk from the white. 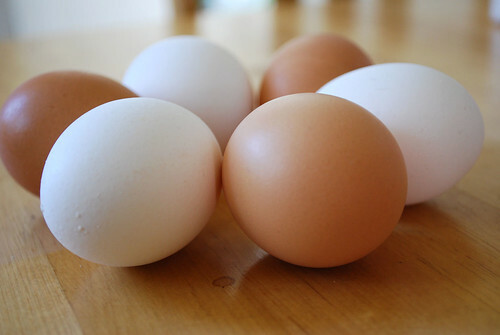 Use the egg shell to help you do this by slowly transferring the yolk from one half to the other until the white has completely separated into a bowl below. 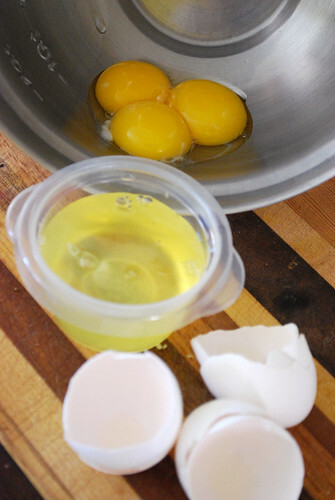 Put the yolks into your metal bowl (or the top half of your double boiler). 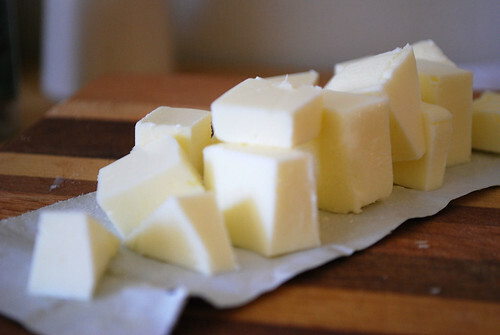 Cut the butter into small pieces. This will help it to melt faster when you add it to the egg. 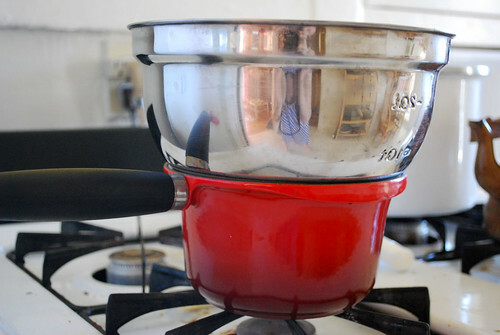 Fill the bottom half of your double boiler with a few inches of water. Set it to heat on medium. You want the water to be at a simmer. When the water is simmering, place the top half of your double boiler over the water and whisk the egg yolks. You must whisk constantly, or you risk the eggs curdling. Continue to whisk until the yolks become thick and bright yellow, about 1-2 minutes. Take the yolks off of the heat and whisk in the butter. Return to heat, whisk constantly until butter dissolves, then take back off the heat and add the lemon, salt and a few turns of a pepper mill. If you use white pepper, just sprinkle a bit in. Add more lemon and salt if you think it needs it. If at any point during this process you see that the eggs have begun to curdle, add a tsp or two of boiling water and whisk it in. Leave the sauce off of the heat and poach the eggs. Fill a pot half full with water and add 2 TB of white vinegar. The vinegar helps keep the egg together while you are cooking them. 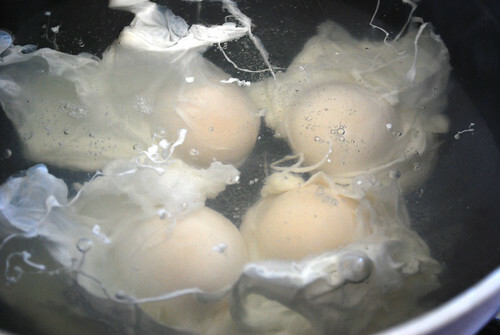 Set the pot over high heat and wait for the water to boil, reduce to a simmer, then crack all 4 eggs into the water and cover. Cook for 1-2 minutes. 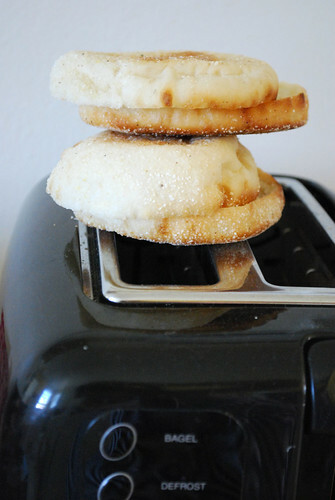 While the eggs cook, toast the english muffins. 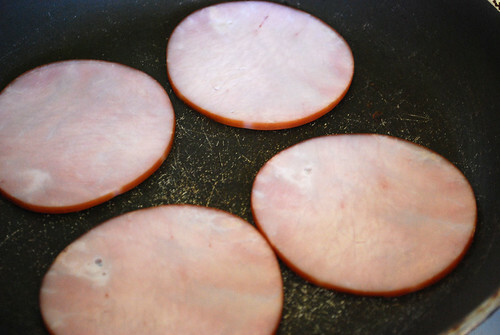 And fry the canadian bacon. Right before you’re ready to assemble, heat the hollandaise through by putting it back on the double boiler. Remember to whisk! Whisk whisk whisk. This, ladies and gentlemen, is what I dream about. 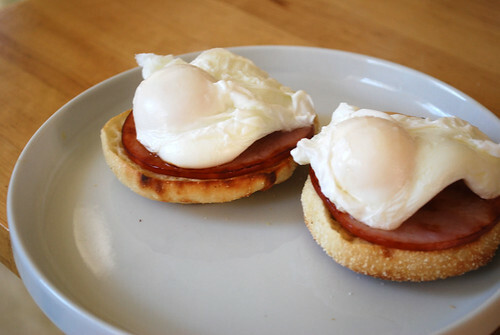 I also want to say, quickly, that this recipe is very easily modified into a number of different types of benedicts, such as eggs florentine-which substitutes spinach for the canadian bacon. This is a good option for our vegetarian friends, and peoples who might worry about their waistline. Of course, that hollandaise is a real diet-killer, but so very worth it! This recipe sounds wonderful. This recipe reminds me a lot of the eggs benedict served at Butler & the Chef in San Francisco. The hollandaise sauce they make there has the most lovely lemony edge, and they use kalamata olive bread instead of English muffins. Their vegetarian option replaces ham with a thick slice of heirloom tomato. Its serious business. Can’t wait to try your recipe! Thanks! I’ve been to The Butler and The Chef, but never for breakfast/brunch. The dinner I had there was amazing though! I’ve been making this hollandaise for at least 15 years. It’s one of the very first things I taught myself how to make, because I was a crazy 10-year-old. Oh My Goodness this recipe is The BOMB! Thank you Thank you Thank you. Girl you RAWK! just made this as a test for my self before i make it for diner tonight. It was so good im looking forward to having it again today! Thanks for the easy awesome recipe! You’re welcome! And thanks for the lovely compliments.